Make sure bluetooth detection is enabled in the advanced settings. Also if you have recently upgraded the firmware on the device then you sometimes need to uninstall and reinstall the app to clear it's settings. Next version will have an option within the settings to reset the autolearning data only so no uninstall/reinstall will be needed. my note 2 is rooted so i can use that method, but on my galaxy camera i'll try the delay option. Thanks to "Unknown" for this freezing-solution! It's working on my Galaxy Tab 2 10.1, too! Many thanks for the tips. This alone could be a reason to consider rooting. May seems silly but it confused me at first if you do the freeze thing you have to restart your phone/tablet for it work. How is it possible to refresh the initial keyboard layout after a wrong modification of scancode? You can choose a new predefined layout and the choose to create a custom layout and overwrite your current custom layout with the predefined one. 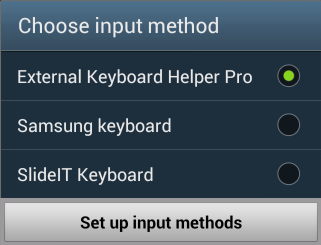 So, this workaround does nothing for me on my Galaxy Note 10.1. Ive set the delay to 2, 4 or 6 seconds but the EKH window never pops up. Any thoughts or new info about this problem? (Using swedish bluetooth keyboard and 4.1.) Damn Samsung, this feature is more like a bug. Try checking the "Old style detection" option the advanced settings. The new detection method tries to filter out headsets and only detect real keyboards. With some keyboards you need to check this checkbox. 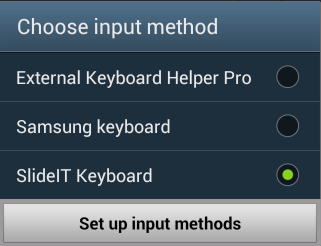 I purchased a Perixx bluetooth keyboard to use with my Samsung Galaxy Tab. When I type a "e" it opens the e-mail. When I type "s" it brings up messages. When I type "g" it brings up gmail, and "b" doesn't work. How do I fix this? 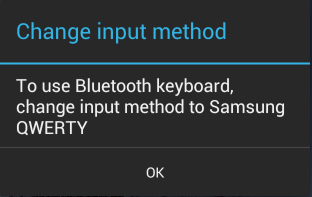 This happens because the bluetooth connection get's broken and reconnects and Samsungs code kicks in forces their input method back on. It's really frustrating but sadly nothing more I can do about it. An USB-OTG adapter and an USB keyboard might work better as it should do the reconnecting thing all the time, However not all devices support USB keyboards so there is no guarantee that your do. I plan to buy a Samsung Galaxy Tab A 10.1 2016. Is the problem solved with Samsung devices? I pray for an answer, thank you.